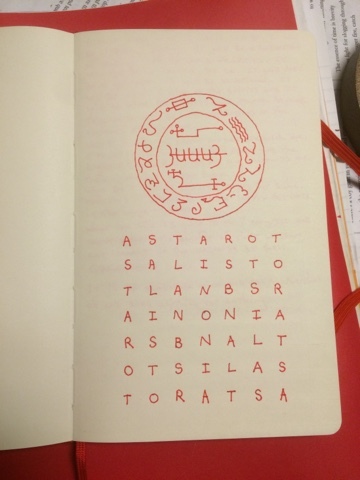 Page one of a new journal dedicated to Astaroth. 100 pages to fill. I'll keep you updated on how it progresses. For those of you unfamiliar with what is depicted here, on top is Astaroth's seal from the True Grimoire, below is the word square from the Book of the Sacred Magic of Abramelin the Mage "for emeralds". This is an account of me practicing my visualization/astral skills by working with the Spirits of the Mansions of the Moon. It is entirely UPG. Enjoy. Raubel in the House of Atarfa. I step through my door and onto a green, grassy hilltop. The wind is blowing and bending the blades of grass. The sky is bright blue and fluffy white clouds drift on the wind. Directly in front of me, hovering above the hilltop is a man brightly glowing red all over. He is like a red light and it is so bright that I can't see any details or features, just the shape. His hands are outstretched so that he resembles a letter tau or a crucifix. He announces to me that he is Raubel. I introduce myself and say that I wan to learn his magic. He descends and touches down on the hill in front of me. He reaches up and pulls a hood from in front of his face revealing his head. This makes the glow disappear. His clothing now looks like normal canvas colored red. The features of his face are all disproportionately large and exaggerated. He says, "first thing to learn is how to breathe," and he gives me instruction on modifying my breathing. I follow his instructions and I can feel a change in vibration over my whole body. Then he glows red again but not as brightly as before. He reaches out his hand toward my head. A glowing sigil of red lines floats out of his palm and melts into my forehead. He suggests I try my hand at glowing. I glow blue and I see a blue sigilized version of my name. It hangs between us but disappears as Raubel levitates again, spreading his arms wide as before. He tells me that the levitation is a skill for which I am not yet ready and that we had probably done enough for now. I thank him and turn back to my door and leave. Annediex in the House of Annathra. I stepped through my door and into the Mansion Annathra which appeared as the tree tops of a very dense forest. The branches and leaves are so thick that I can step onto the tree tops and they hold me up. There is a slight give as they bend slightly under my weight. It is like walking on a giant woven basket. The surface undulates with the different heights of the trees below. I walk for a bit not seeing anyone. The sun is out and it is a pleasant day. I wonder that I haven't seen anyone. I look down and see that the branches have thousands of small ants crawling around on them. As I watch, the ants arrange themselves to form a large face of moving, writhing ants. The face smiles. I ask if it is Annediex and in a woman's voice she says she is. I ask, "what is your magic?" In response she laughs and the ants crawl away, dissolving the face. It looks like water flowing away into the texture of the tree. Then a gigantic ant with wings walks up to me. It is bigger than I am and it is stark white. It stops in front of me and I crawl up onto its back. It flies off and to a castle made of the same living tree tops as the floor. The ant lands on a large balcony. I look at the walls of the castle and see that the branches that form the walls are actively growing, slowly flowing into the shape of the building. I walk into the doorway of the balcony and into the castle. Inside there is a large rug on the floor and shelves full of various things. Near the far wall there is a man in a long robe who turns toward me as I walk in. He has a long beard and he says, "I am Morex and I am here to teach you the magic of Annediex." I am impressed and I thank him. I ask when I can talk to him and he tells me when the Moon is in this Mansion. I ask if I may have a lesson now. He pulls out a small dish full of water and shows me a method of dissolving influence into it. I thank him again. He points to the giant white ant that is still on the balcony and says that it is named Valan and that he has something to show me. I walk out onto the balcony and crawl back onto the back of the ant. It flies up and then then dives under the tree tops of the forest. Under the mat of branches that form the canopy the forest floor is dark and thick with thorny tree trunks. Valan says, "the thorns are deadly. The bark is bitter but healing." I tell Valan that I enjoy this Mansion. He says, "the Mansions will be good to you but you don't understand them yet. Each Mansion has two sides but that the manifestation isn't dependent on the astrological conditions." I thank him and make my good byes and leave. Geriz in the House of Alnath. This session came very easily this time. When I stepped trough my door I found myself on the floor of a Roman coliseum. The day is hot and dry. In front of me is a gladiator with a sword, wearing a helmet, with his arms raised in victory. The bodies of dead men are littered around the arena. The crowd cheers loudly. I suddenly feel very conspicuous with the roaring crowd all around. The gladiator faces me and says cheerfully, "come, let's celebrate," and he leads me through a door on one side of the arena. Through the door we come to a small room with a rough table. The walls are yellow and the texture of rough plaster. The gladiator takes off his helmet. His hair is dark and clings to his head with sweat. His face is flush and ruddy. He smells of sweat and blood. He smiles at me and puts his helmet on the table. He picks up a bottle of wine and pours some into two cups, one for each of us. I ask, "what is your magic?" He makes a fist and says, "driving through,' as he makes a punching gesture. Back in the coliseum the sound of a horn calls out. The gladiator looks up and grabs his helmet. He walks back onto the floor of the coliseum. I follow him to the door but I hold back at the door. There is now a minotaur with a sword ready to fight. The gladiator advances and kills the minotaur easily. The crowd roars. The minotaur falls onto a stack of bodies I hadn't noticed. The gladiator turns to me and says, "I want to show you something." He walks back into the small room. Now on the table are large sheets of paper covered in diagrams. I leaf through the papers but I don't really understand or recognize what is drawn on them. "Strategy is very important," he says. Then with passion he says, "now is the time to put your plans into action!" Before I can say anything the horn blows again in the coliseum. The gladiator grabs his helmet and heads back out. I take the opportunity to leave and end the session. This is an account of my practicing my visualization/astral skills by working with the Spirits of the Mansions of the Moon. It is entirely UPG. Enjoy. Anuxi in the House of Arrexhe. When I opened my door into the Mansion of Arrexhe I found myself in a landscape that looked like the surface of the Moon. It was gray and rocky and thick with dust. The sky was black and starless. I walked for a bit and soon came to a small, round grass hut. The dried grass of the walls and roof were a golden color that stood in stark contrast to the monochrome grayness of the landscape. As I got closer to the hut a man comes out of the door and challengingly says, "hey, who are you?" His head is shaved and he is wearing clothes made of animal furs. I introduce myself and say that I am looking for Anuxi. He relaxes a bit and cheerfully says, "oh, come in," and he turns and reenters the hut. I follow him and see that the interior of the hut is a spiral staircase leading down. We walk down the stairs and at the floor the room is no bigger than the hut. In the middle there is a large stone that looks like it is used as a table and two stones for chairs on either side. There seems to be a shaft of light coming from above and illuminating the stone table. It does not look like a habitation. Anuxi asks me if I play cards. I say, "sure, I guess." Excitedly he gestures for me to sit. He deals some cards. I look at the cards in my hand and see I have a queen, an 8, and two 2s. The cards don't look like the regular suits of playing cards as they change colors in my hand. Anuxi puts two small silver fish on the table between us as a bet. I hold out my hand to the side and envision two similar looking fish that appear in my hand. He looks at me sideways seeming a little wary but when I put my fish on the table as my bet he relaxes. He looks at his cards and cheers. He has 3 queens. "I win," he exclaims as he scoops up the fish. It is only at this point that I realize I don't really know what game we are playing. I decide to try and change the subject so I ask if there are others nearby. He tells me that there is an old man near here. I ask him where he got the fish. Anuxi tells me there is a lake not far away. I ask if we can go there and he assents. We walk back up the spiral stairs and out of the hut. He leads me to a large body of water that is unnaturally still and mirror flat. In fact I'm not sure it is water. I pick up some of the dust from the ground and throw it onto the surface of the lake. The dust sinks into the water but doesn't leave any ripples. I ask Anuxi, "what is your magic?" He says, "long sight," and I get the impression that he means long in time as well as distance. Then the whole vision goes dark. I hear a loud voice say, "the ashes will not break," and I am kicked out of the vision and the session ends abruptly. Abliemel in the House of Al Fargh al Thani. I sat to visit Abliemel as I have for the previous Mansions; envisioning the small stone room and the wooden door with the Moon and the name Abliemel on it. I opened the door and stepped into a meadow with dry golden grass up to my waist. It is sunny and pleasant. I waded through the grass for a bit and come to a white wooden fence running across my path. The fence has a black iron gate in it. I open and walk through the gate. The grass on the other side is greener and thicker and darker. I walk for a few moments and come to another gate and fence, then another and another. Soon they are coming on sooner and sooner. I feel like I'm swimming in fences and gates, like they are almost coming at me. I'm starting to feel clausterphobic. Nearby I see a giant tree and I struggle through a series of gates to get to it. I climb the tree up and away from all the fences. I rest on a thick branch and see next to me a giant songbird, like a sparrow or a finch or something. The bird changes into a young girl of about 6 or so. She is wearing a dress that is the same color as the feathers of the bird. She has black hair in two braids. She says hello to me. I ask if she is Abliemel. She says she is and as she does she changes into a girl slightly older, 10 maybe, still in the same color dress, still with black braids. She looks like she is about to ask a question but never does. She changes to a 4 years old, then 15 or 16. Her image jumps back and forth in age. I ask, "what is your magic?" As a 10 year old she says, "gathering" and then she laughs but it is a laugh of a mature woman. I find it disconcerting coming from a child. I ask, "what is around here?" As a 13 year old she says, "oh, many things". And as I watch her her ages swing more, now 4 years old, now 30, now 75, now 8. I climb the tree leaving her behind on the branch. There is life all over the tree; birds, caterpillars, lichens. When I get to the top I get a view of the countryside. In the distance I see a mountain and an ocean. The sun is high and the air is clear. I can see for a long distance. I climb back down past Abliemel and to the ground. She watches me but doesn't come off the branch. I say, "won't you come down?" She says, "no, I must stay in the tree. I have to keep watch." I ask what she is watching for. Dreamily and seeming to ignore me she simply repeats to herself "...have to keep watch..." I shrug and start making my way back through the gates back to my door. Before I get there I see a hole in the ground with stairs leading down, like a cellar. I go down the stairs and find myself in a cavern of dark stone. The floor is polished and shining. In front of me is a coil of whispy, white smoke. It rises up and takes the shape of a head and torso with a smokey tail. The shape is person-like but without detail. I ask, "who are you?" The smoke person answers, "I am Abliemel." I am a little surprised and ask, "what is your relationship to the one out there?" The smoke person answers, "we are the same, but this is the other side of the Mansion." I ask, "what is your magic?" and this Abliemel says, "passage, opening," and I get the impression of the darkness of the birth canal and of passing out of that darkness. I ask, "what is there to see here?" Abliemel says, "Things of no light. Would you like to see?" I say, "no, not right now, another time. Thank you." Abliemel says, "my pleasure, come again," which again surprises me. I turn around and the door back to my entrance chamber is right behind me. I step through and leave. It has a bit of time since I've posted on the blog here. Thankfully it is because I've been working and not because of some other, less productive reason. So what have I been working on? Let's see if I can summarize. My Surgat talisman sits only half done. I haven't moved forward on that for two reasons which I'll mention below. My Astaroth First Character still sits in my shirt pocket. The culmination of that working has been stalled in favor of deepening my research on Astaroth. This deeper research into Astaroth is one of the reasons the Surgat talisman is delayed as I am trying to maintain the hierarchy of the True Grimoire. So the plan is to finish Astaroth first, then finish with Surgat. I have been doing research into the Sumerian goddess Inana as part of my larger research on Astaroth. Inana's descent into the Underworld is a myth rife with symbolism that will be helpful in my conjuration of Astaroth and my own journey to the Underworld. After reading Jake Stratton-Kent's A Prince Among Spirits I have decided that one of the necessary things to continue with both the research into Astaroth/Inana and Surgat is to work with the Spirits of the Mansions of the Moon. This is the second reason the Surgat talisman has been delayed. So, that is what I've been doing for the past few weeks, everyday trying to contact the Spirit of the Mansion of the Moon in which the Moon resides at that time. After doing a tarot reading about the best way to perform this project I have been trying to improve my visionary/astral skills. At the beginning these skills were atrocious and neglected. Now, after 17 days of practice, my skills are a bit better but I still have a lot of room for improvement. It is all related and it seems that one leads to the other, hence the title of this post. The Spirits of the Mansions of the Moon is a subject that is ripe for exploration. I've been swimming in my own UPG (unverified personal gnosis) with this project as a way to break the ice between me and this category of spirits. As I continue I will post more of what I learn.